Happy Wellfie Wednesday! Welcome back! This week's post is brought to you by Aaron (@AaronPerezPT). Enjoy! Today's post correlates well with my last #WellfieWednesday post Reframing Low Back Pain. Where I had compared low back pain to the common cold. I really like that analogy; however, it seems most applicable to acute low back pain. Unfortunately, back pain is more likely to persist and can become disabling. Today’s post introduces a helpful way to reframe persistent pain scenarios through a simple yet powerful thought experiment and diagram. The circle below represents my life and several activities that bring my life meaning and joy. At times, pain is also part of my life. Fortunately, I’ve never dealt with persistent pain and disability. However, I’ve worked with many people who have. And I’ve learned that sometimes when pain becomes a persistent problem we gradually do less and less of the activities we enjoy. This effectively makes pain a larger part of our life. 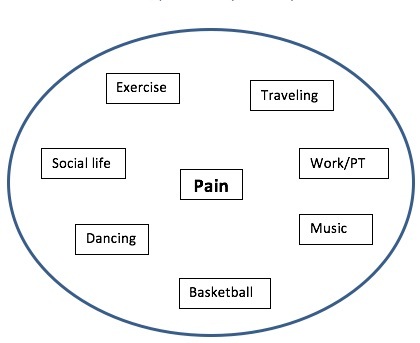 While pain alleviation is often a primary goal, making this the primary focus of rehab sessions can be unproductive. Rather, focusing on function and strategies that gradually allow us to resume meaningful activities can be really helpful. With more of our life back in the picture, pain will no longer be such a big part of it. It won’t be easy, but it can be done. Pain is often a part of life. Suffering doesn’t have to be. This thought experiment really resonated with me when I first learned it at continuing education course a couple years ago. I’ve used it with many patients since then and found it often helps patients reframe their pain and understand the purpose of rehab. I hope it resonates and helps someone else suffering with persistent pain. Welcome back folks! Happy Wellfie Wednesday! As we near the end of 2016 and you begin to think about those New Year's resolutions, I wanted to get you thinking about your overall lifestyle and where improvements could be made as we enter 2017. In an unorthodox way of doing so, I'll ask you to think about your risk of heart disease. As the current #1 leading cause of death in the United States, it is something you should be considering. Take a look at this infograph below by the American Heart Association. Notice the larger list of modifiable risk factors, those are factors that can be addressed with choosing healthier behaviors, most notable is a healthier eating pattern and increased physical activity. Think about those as you plan to start your new year! If you need ideas for healthier habits, check out #WellfieWednesday on Facebook, Twitter, or Instagram and see how others choose healthier behaviors. And as always, thanks again for all of the #WellfieWednesday support, be sure to post your pictures again this week and tag Eric (@Eric_in_AmERICa) or myself (@PBernerSPT) and keep the wave of healthy change going! Wellness Wednesday Tip #14: Have a Plan to Prevent Breast Cancer! This week’s Wellness Wednesday Tip: Have a Plan to Prevent Breast Cancer! “About 40,450 women will die from breast cancer” this year. Click here to check out the risk factors for developing breast cancer. They include such factors as age, ethnicity, family history, early onset menstruation, late onset menopause, birth control use, being overweight/obese, and the main factor of being a woman. But don’t forget! Men are also at risk for the development of breast cancer. “Women ages 40 to 44 should have the choice to start annual breast cancer screening with mammograms if they wish to do so. The risks of screening as well as the potential benefits should be considered. We hope you’ve learned some beneficial information for the prevention of breast cancer; please spread the word! And as always, thanks again for all of the #WellfieWednesday support, be sure to post your pictures again this week and tag Eric (@Eric_in_AmERICa) or myself (@PBernerSPT) and keep the wave of healthy change going!